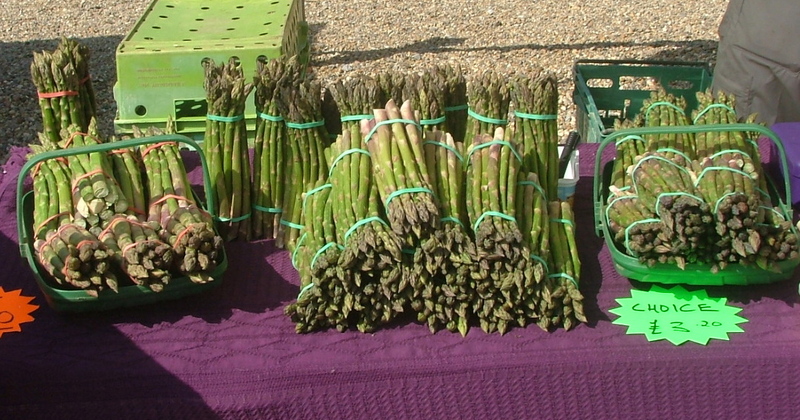 It’s Asparagus Day at Penhurst Farmers’ Market this weekend (Saturday 1st June), and I’ll be there with Michael Bourne of Groombridge Farm cooking up some of his wonderful just-picked asparagus for visitors to try. The season may have arrived late this spring but now it’s in full swing and with only a couple of weeks to go, this is the time to fill your baskets with one of the finest treats of the culinary calender. Michael and I will be talking about the best way to cook and serve this sublime vegetable, from the fat premium grade spears that only need simple preparation to the sprue, which is best for cooking in dishes such as soups and risottos. We’ll have dishes to taste and plenty of ideas and suggestions plus recipe cards and sheets. Here’s a recipe I came up with this weekend, adapted from my Busy Mum’s Cookbook. I add asparagus to the classic dish, which turns it into an all-in-one meal. Since having my own hens this has become even more of a favourite but it still works well with good free-range eggs. 1 Trim the ends of the asparagus and cook the spears in simmering water for 3- 4 minutes until just tender. Drain and cut into short lengths. Whisk together the eggs, Parmesan and seasoning in a small bowl and set aside. 2 Cook the pasta in a large pan of boiling water according to pack instructions until just tender.While the pasta is cooking, cook the pancetta a small frying pan for a minute until the fat runs then add the garlic. Cook for 2 – 3 minutes until the pancetta is crisp and golden then add the wine and simmer for a minute or two until reduced by half. Keep warm. 3 Drain the pasta, return to the pan and add the contents of the frying pan, the asparagus and the egg mixture. Return to the heat for 30 seconds and toss thoroughly together – the sauce should be creamy but don’t overcook or the egg will scramble. Serve at once. Cook’s tip: You can add other vegetables as well as or instead of the asparagus. I use little courgettes, cubed and fried with the pancetta, frozen sweetcorn, small broad beans, peas or French beans cut into lengths – or sometimes a mix of all of them. For veggies I replace the pancetta with toasted pine nuts. 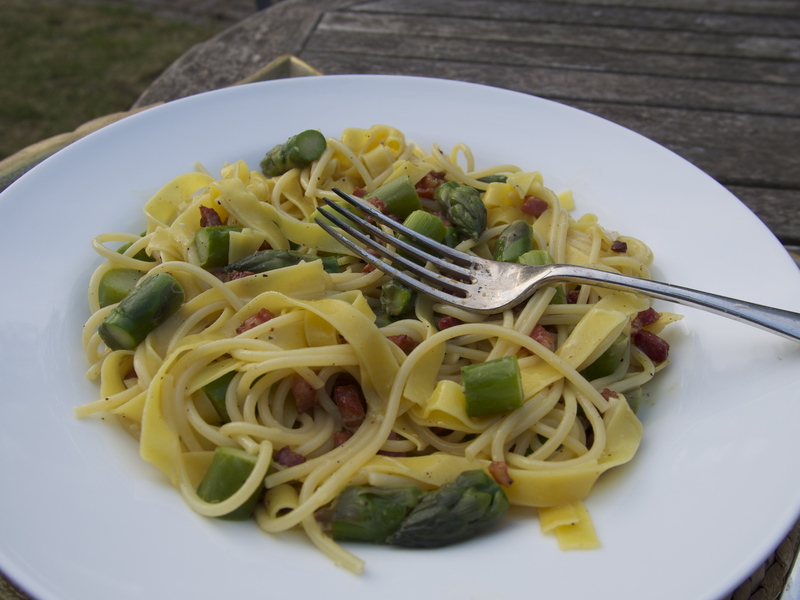 This entry was posted in In season, Recipes and tagged Asparagus, Kent farmers markets, penshurst place, recipes. Bookmark the permalink.